Is Renting A Furnace A Good Idea? After purchasing a new home, many home owners are faced with the task of deciding whether it is beneficial to rent a furnace or to simply go out and buy one? Both options have their benefits and drawbacks. When you purchase your own furnace, you will be expected to pay the entire amount. However, owning your furnace offer a better long-term savings. In terms of payment, many large retailers offer low-monthly financing options so that you don’t have to wait until you’ve saved up enough money to purchase a furnace. However financing or paying the entire amount up front does not provide coverage on servicing and repairs. You will have to pay for these services out of your own pocket. By owning your own furnace, it adds value to your property and lowers long-term costs. You can also take advantage of lower energy bills at the end of each month. To rent a furnace, you will be required to sign a long-term contract and pay a monthly or quarterly fee. The length of your contract will determine your payment frequency. When you sign a rental agreement, all risks that may arise from owning your furnace are erased. Since the rental company will continue to own the system, they will find it beneficial to keep it operational. As a result, all servicing and repairs are conducted by the rental company for free. If the need for a repair or replacement arises, a rental furnace will respond promptly, and deliver professionally. By not having to deal with ongoing maintenance, system break downs, accidental damages and part replacement, you actually lower your monthly costs while taking advantage of lower energy bills. In addition, if you opt to sell your home during a rental agreement, you may transfer it to the new owner without any hassles. 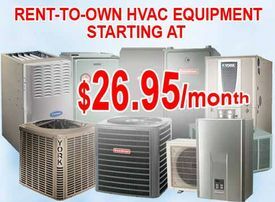 Many rental companies also offer rent-to-own programs where you can own the furnace at the end of the contract period. Renting a furnace is a simple, hassle-free and convenient option for homeowners who do not have the money to make a large payment or keep up with service and maintenance costs, parts replacement and repairs. Is renting a furnace a good idea? Definitely, yes!